Haitian art is known for its bright colors and themes from island life, such as fruits, flowers, and exotic wildlife. Most people in Haiti don’t have ready access to expensive supplies, so artists create beauty by using what they have around them. That’s why papier maché bowls and vases made from paper scraps are popular. Using paints, artists add bold, tropical colors and designs inspired by the vistas of Haiti. 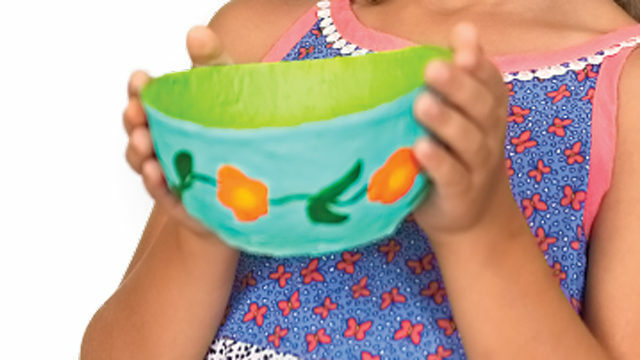 Try creating a papier maché bowl using colors and designs that inspire you! 1. 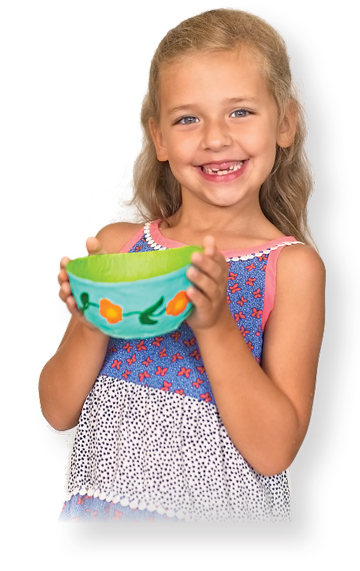 Place your plastic bowl upside down on work surface, and cover the bottom and sides with plastic wrap. 2. 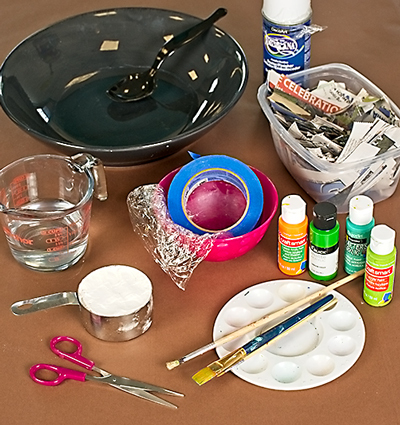 Use painter’s tape to secure plastic wrap inside the bowl so the wrap doesn’t move as you work. 3. In a wide bowl, combine one cup flour with one cup water, and mix well to remove lumps. Paste should be a thick glue-like consistency. Add a little more water if paste is too thick. 4. Dampen a strip of paper in the paste. Gently slide wet paper between two fingers to remove excess liquid. Then adhere the strip to the bowl form. Continue adding strips of wet paper, criss-crossing pieces to fill the entire surface of your form. 5. Let the first layer dry completely, then add a second layer of paper strips to the form. Repeat with a third layer, if needed. 6. After adding your final layer of strips, let the piece dry for at least twenty-four hours (or longer!) to ensure that the piece has cured. 7. Remove the tape holding the plastic wrap to the plastic bowl form, and gently lift hardened shape from the form. 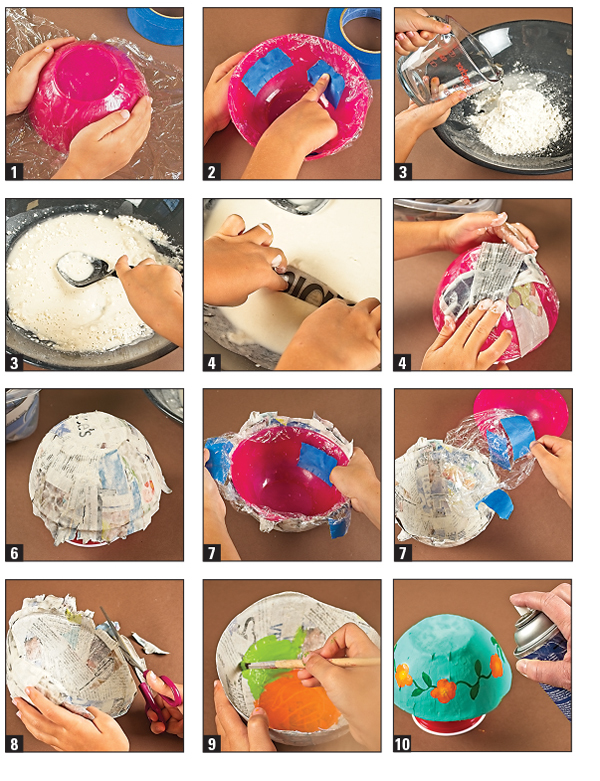 Carefully remove the plastic wrap from the inside of the papier maché bowl. 8. Trim the top rim to clean up and straighten the edge of the bowl. 9. It’s time to paint! Consider using bright colors and tropical themes like Haitian artists, or use your favorite colors and designs that inspire you from the Richmond area.